Our hot blooded summer has definitely arrived. As I sit here and type, the morning sunlight streaming through my window has that fierce quality only summer sunlight here has. I squint even if I’m not looking directly at it. And the heat…oh boy. We have gone from slow roast to flash sear; the temperature shooting upwards with no thought for the poor creatures (like me!) it singes and melts along the way. Summer is here. I can almost hear the sizzle as my flip-flops hit the pavement. Time to escape the city! Summer is the time for fresh mango juices dribbling down your chin, for digging your toes into the sand, for the sting of salt water or the blessed coolness of the pool. It’s the time to find a way out of the concrete jungle and into a place where you can still hear the birds as you nap. And, although I am all grown up and no longer have the luxury of a summer vacation, it is the time to find ways to slow down (because god knows you can’t go any faster in this heat!) over an ice cold rum+coke, if only for the weekends or the warm summer nights. Luckily, the long Easter weekend is almost upon us and we will be out of the stifling city heat for a while! We are not dashing off to the beach; more’s the pity, but just to my mum-in-law’s farm outside the city. While it doesn’t have the sea nor the sand, it does have a pool, cool nights, a house with gorgeous wooden floors that never get hot (and are heaven to walk on barefoot), and a lovely kitchen for me to play in! Plus a white canopy bed where, I swear to you, I have the best naps of my life. This is one such do-ahead thing. I love marinated olives and think they are perfect cocktail food. Over here though, good-quality pre-marinated olives are a tad expensive, and really, make no sense when you can easily be marinating your own for a fraction of the cost. This recipe is one of the several I like (although it’s just as easy to wing it in the marinated olives department). – Pit the olives by placing them on a chopping board then pressing down on them with the flat blade of a large knife. You don’t want to crush them to bits, just crack them open so you can remove the pits. 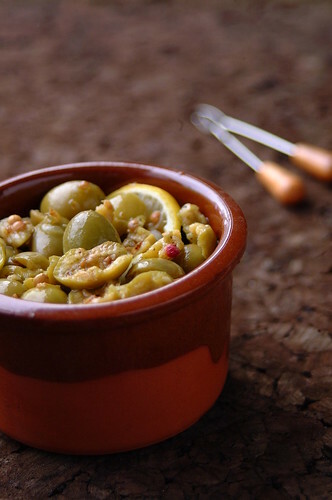 Place olives in a bowl and discard pits. – Cut four or five thin slices from the lemon half (discarding any pips) and add to the olives. – Roughly crush the coriander seeds in a spice grinder or coffee grinder, or using a mortar and pestle. Do not grind them to a powder; you just want the seeds cracked so they release their aroma. Add this to the olives. – Juice the other lemon and add to the olives, along with the garlic and the olive oil. Season with pepper. Taste first before adding any salt as the olives are probably salty enough. – Mix everything well and leave to marinate for at least an hour before serving. This will keep for a week in the fridge (covered). I like this recipe because I love the aroma and flavor of coriander seeds. Tessa says this is a typical Cypriot preparation. If you are too lazy to pit the olives, then leave them unpitted, or, like I did here, only pit some of them. This is great for a cocktail party because you can make it ahead (it will actually get better and more infused if you let it sit overnight) and have it on the table when your guests arrive – distracting them and giving you time to finish up the more a la minute stuff.